The new platform allows for a more convenient and personalized banking experience by pairing real bankers to customers using a new mobile format that is unlike any other online banking experience. Say hello to your new BFF. No, not your best friend forever. Your "Best Financial Friend," one of Umpqua Bank's trained experts who are part of the new human-digital platform Umpqua is rolling out to its customers. Six months ago Umpqua Bank began testing a new proprietary format at three Portland area branches — including Lake Oswego — for customers to interact both digitally and face-to-face with a team of bankers dedicated to helping customers with a variety of banking needs from wherever they are, whenever they need it. It's like having a personal banker in your pocket. You download the application to your phone, choose from Umpqua's dozens of professional BFFs and start banking in a way that is more personalized and convenient than ever before. Umpqua's Executive Vice President for Communications Eve Callahan said the platform was born after watching consumer behaviors and seeing a strong demand for digital and online convenience. After observing retailers nationwide reevaluating and changing their proportion of physical locations to digital and online resources, Umpqua Bank decided to improve upon the current online banking services by improving the digital and technological convenience for its customers. "There are still some really important moments where life and money intersect. We as Umpqua, have a unique opportunity to actually use technology not to push customers away and into their own self-service channels, but to empower our teams to build even deeper relationships in the space people want to be," Callahan said. "We all text and facetime with friends and family all the time. It's a channel we're all really comfortable within, yet banks haven't really used that all that much to say, hey let's not just give you an alert about going over or under a set limit on your account, but actually help you understand how you can use your bank and your money to live even better." 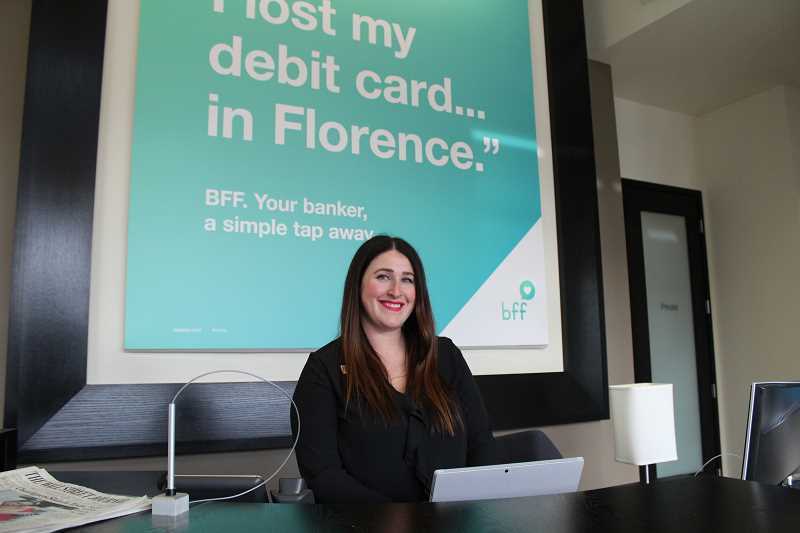 The outcome of that thinking is the BFF pilot program which has seen more than 1,800 Umpqua Bank customers sign on to use the platform. BFFs can do anything a branch banker can do with the exception of handle cash, according to Callahan. Whether it's transferring money between accounts, ordering new checks, asking questions about a mortgage or loan, your BFF has you covered. And the best part about it is you get to choose your BFF so you have the most personalized help available. "The responses have been phenomenal. We did a survey, and about 95 percent of (pilot users) felt the experience was as good as they'd experienced in the store," Callahan said. "We really tried to remove the barriers between people and their money. Banks have this history of being intimidating and unpleasant locations.We've tried to make our experience as welcoming and engaging as possible, kind of a community center. Lake Oswego Branch Manager Jadah Goldblum believes the new platform allows her and the rest of the Lake Oswego team connect with customers in a way they've never experienced within banking. Rather than having a faceless robot to chat with online, it's a living, breathing human who cares about the customers convenience and the outcome of their transactions. "You can have someone a text away on your phone, that you can also come into the branch and you know them well and trust them with your banking. That's something no one else offers, so it's pretty amazing," Goldblum said.